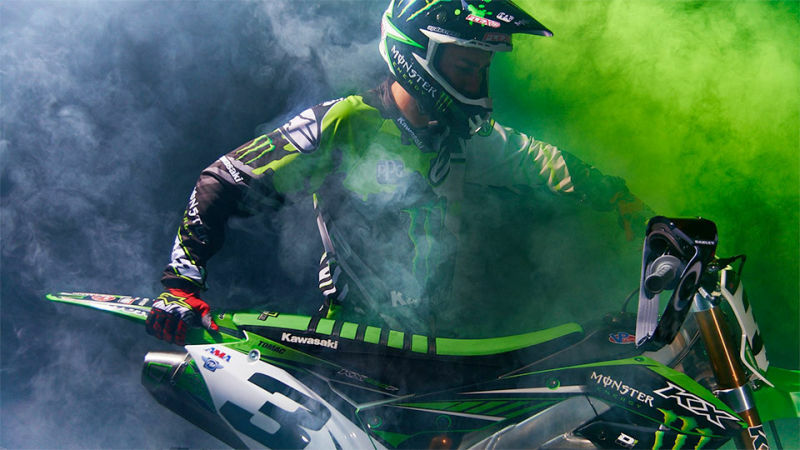 Eli Tomac is a multi time AMA Supercross and Motocross champion from America. He became a professional motocross rider in 2010 when he was 18 years old and won his first pro race, the only rider ever to do so, at Hangtown National. Winning a supercross and U.S. motocross championship in 2012 & 2013 he moved up to the premier 450 class at the beginning of 2014. He won his first 450cc title in 2017 after overcoming a double shoulder injury in 2015.
Notable Injures: 2015 – Double shoulder reconstruction. 1st – AMA Pro Motocross 450cc Championship. 2nd – AMA Pro Motocross 450cc Championship. 14th – AMA Pro Motocross 450cc Championship. 4th – AMA Pro Motocross 450cc Championship. Represented Team USA at MXON in Latvia. Team USA finished 3rd, Eli Tomac finished 3rd in Open class with 6 – 3 scores. 1st – AMA Pro Motocross 250cc Championship. Represented Team USA at MXON in Germany. Team USA finished 2nd, Eli Tomac finished 4th in Mx2 class with 16 – 2 scores. 3rd AMA Pro Motocross 250cc Championship. 2nd – AMA Pro Motocross 250cc Championship. 6th – AMA Pro Motocross 250cc Championship. Eli Tomac’s father, John Tomac, is a famous mountain bike rider. Eli Tomac won his first ever professional race, the first rider ever to do so. After scary crash in the first race of the 2013 Motocross of Nations in Germany, the video went viral, thankfully Eli was ok and was able to finish. You can view the crash below. Video: MEC post press conference – Tomac, Anderson and Savatgy talk!